With a 6-0 record and a No. 5 ranking, Washington is drawing national attention for Jake Browning and John Ross. But please take a moment to salute the large, mean persons up front. Gaudy as are marks put up by Washington’s skill players — QB Jake Browning leads the NCAA nation in pass efficiency and WR John Ross is No. 1 in TD receptions — we pause a moment in the growing Huskies hysteria to consider the work being done by the offensive line. Much as with the Seahawks, the Huskies O-line was the preseason object of speculation and even apprehension around Montlake. It has been that way for some time. Washington hasn’t been terrible in the department, but there’s no getting around the fact that not since 2001 has UW had an all-conference lineman. It is a bit baffling, although the turn away from the bruisers began when Rick Neuheisel was hired to coach in 1999. He loved the flash and dash guys. Then came the Tyrone Willingham sadness, when few high pedigree at any position came to Washington. Steve Sarkisian did somewhat better. But given the stout gentlemen in the tradition — Rick Redman, Ray Pinney, Blair Bush, Tom Turnure, Bern Brostek, Lincoln Kennedy, Olin Kreutz, Chad Ward. to name a few — it is remarkable that no one earned all-league honors since C Kyle Benn of the 2001 Rose Bowl team. But that could change, perhaps as soon as this year. When a team starts 6-0 and ranked fifth in the AP poll, attention comes in truckloads, particularly in a season when the Pac-12 as a whole may be down. Sophomore RT Kaleb McGary 6-7, 308, Fife). Because Brostek sat out Saturday’s game with an injury, junior Andrew Kirkland (6-4, 311, Portland) started against the Ducks. In that game, the Huskies rolled for 680 yards of offense against their longtime tormentors, who played more like Idaho than Oregon. The remarkable part was how the big boys, including the defense, owned the line of scrimmage, long a province of the Ducks. To watch UW rush for 378 yards and an 8.4 yards-per-carry average was astonishing. Not only does Washington appear to have an old-school, USC-style stable of backs in Myles Gaskin, Lavon Coleman and Jomon Dotson, Browning scored two rushing TDs and is now a threat to go at any time. As well as a threat to win the Heisman Trophy, the most prestigious individual award in college football. Browning’s name has appeared in numerous top-five media watch lists. When in comes to awards, Petersen predictably is covering his ears and singing la-la-la. “I think it’s so early for all this stuff — you guys already know I’m going to say that,” he said. “There’s so much football left to be played for all this different stuff. As always, Petersen prefers to let actions speak. And the conference- and nation-leading offensive numbers speak to work done by a line that has developed well under the tutelage of Chris Strausser, the associate head coach who’s in charge of the O-line. Strausser spent 12 years over two stints at Boise State and joined Petersen’s move to Montlake in 2013. 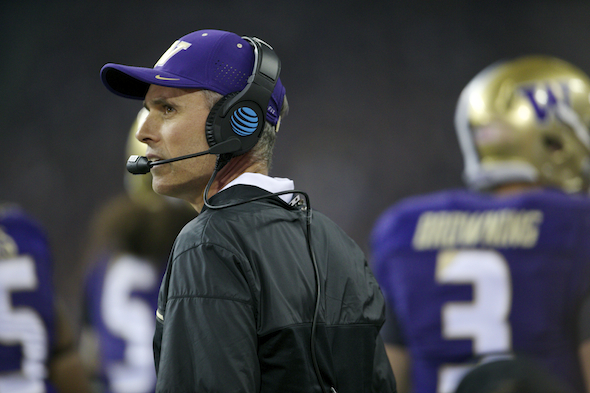 In Strausser, “We have a really good offensive line coach,” Petersen said. “He develops guys as good as anyone I’ve been around. When we were at Boise, so many of the (O-line recruits) were wanted by nobody. And a lot of them played in the NFL. The Boise State media guide lists four linemen as NFL draftees, the most prominent of which is Ryan Clady, a first-round pick by Denver who played seven seasons with the Broncos, and was a six-time All-Pro selection before moving to the Jets this season. Huskies tackles Adams and McGary, both sophomores, are seen by scouts as having NFL-sized bodies and strength. Coleman, who has played all five line positions at Washington, Eldrenkamp and Brostek have improved steadily with experience. Three of the five are in-state players. Another Petersen hopes to add is 6-6, 300-pound Foster Sarell of Graham-Kapowsin High School in Pierce County, whom scouting services list as the state’s top player. Petersen made headlines when he flew by helicopter to check out Sarell at a recent game. Scoring a combined 114 points in wins over Pac-12 rivals Stanford and Oregon have evoked comparisons to Huskies teams of the early 1990s that went to three consecutive Rose Bowls. That’s heady stuff, none of it possible without a Don James-style commitment to old-fashioned hairy-knuckle meanness preceding the glory guys. Good words, Art. And Browning is making great decisions based on his experience. The team seems solid everywhere. The lines are working so well together, it certainly does say a lot about the coaching. And they’re doing this without the biggest advantage from the early 90’s, in a word, Entman. I had season tickets from the 1970s to ca. 1994 and Steve Entman was the very best football player I ever saw, bar none–linemen, backs, whatever. I’ll never forget the UW-Michigan game when the Huskies won the national championship. Entman was phenomenal. The talent is near NFL levels in several spots, but there’s no Emtman-level guys. Art – The two names that I saw were left off your O-line list are C Bruce Jarvis, who was part of the Electric Company, blocking for Juice, and All-American Benji Olson. I am just very impressed with each unit on this team: I am not there yet in making comparisons to the 3 Rose Bowl teams, but these guys appear to be headed in that direction. The O-line, RB’s, D line, LB’s, DB’s, Receivers, QB: Where are the holes? I honestly don’t see them. Given the offense’ remarkable improvement over last year, albeit with a freshman QB, I must believe the very interesting addition of Tedford has something to do with it. What’s your take on his impact? Two worthies. And there are others. I claim no knowledge of the inner staff workings, but I can say that Tedford’s success with offenses, plus the respect he has from Petersen, are big assets. Other than McGary and Adams, the rest were not highly recruited. Shelton, Eldenkramp, Kirkland were guys no one really wanted and Sark had to settle on after striking out spectacularly. Brostek has the pedigree but hadn’t put it together until this season. As we move forward the talent level on the OL could increase quite a bit..especially if they get Sarrell who I think Scout.com has rated as the #2 recruit in the entire nation. My new favorite Husky is Kaleb McGary. I would love to hear more (or any) interviews with this guy. His quote after the Oregon game (“I have to look down to see cloud nine”) was the best of the post game interviews. And then his description of Browning was equally eloquent Would love to read something on SPNW about him. Yes the dawgs are on a great run but how is it that no love is given to the Cougs who are tied atop the PAC-12 north?